Of the more than 10,000 respondents thus far, over half have favoured cryptocurrency. 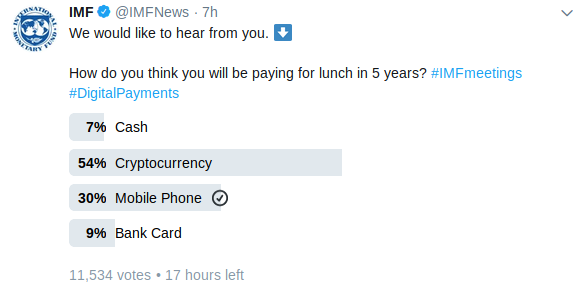 The news here is not that the respondents elected cryptocurrency, this was to be expected on a platform such as Twitter where millennials and FinTwit (Financial-Twitter) roam; the news is that the IMF is actually taking the initiative to see how much an opportunity, or threat, cryptocurrency poses to the international monetary system. Readers will notice that CoinCompass selected Mobile Phone as the answer and not cryptocurrency. At time of writing we see Bitcoin as a store of value and in accordance with Gresham’s law would not want to dispense of it for lunch. We would use the depreciating fiat currency we presume would be available on our phone.